Arrived early hours of the morning, the receptionist spoke very little English and also sent us in the totally wrong direction to our room. In general all the reception staff weren't particularly nice and hardly lifted their head from their Facebook page to say hi. Apartments were very basic, had a very damp smell in the rooms and lacked basic cleanliness standards. The bed linen and towels were very washed out and unclean looking and you had to beg the maids for fresh linen and towels which should have been changed twice weekly anyway. The maids themselves hardly cleaned the apartment and when they did, only cleaned minimum, leaving the floors hazardously slippery. The pool was in the shade for most of the day which was disappointing, but same was a good size and maintained well. The bar was fine although they didn't sell food which was disappointing. The sister apartment up the road catered for you selling snacks and meals which were very nice. The staff at Sunny Dreams were lovely. Arrived in the early hours of the morning and receptionist spoke very little English and also sent us in the total wrong direction to our room. In general all the reception staff weren't particularly nice and hardly lifted their head from their facebook page to say hi. The pool was in the shade for most of the day which was disappointing, but same was a good size and maintained well. The bar was fine although they didn't sell food which was disappointing. The sister apartment up the road catered for you selling snacks and meals which were very nice. The staff at Sunny Dreams was lovely. Best apartment ever stayed in, spotless and really spacious. Great pool, reception and bar staff were great. Great location close to the centre, and near the beach. 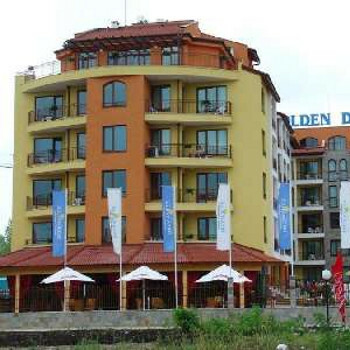 We stayed in Golden Dreams apartments which are well established and have been built to a very high standard. They are well maintained. We had a great time weather was very good the pool was warm which was surprising and also cleaned every day, not much for children to do but plenty of entertainment in the resort not 5 mins walk away. The staff were friendly and very helpful speaking very good English. It was altogether a good hoiday and we will be returning in June this year never encountered any flies!! but the odd wasp if you were drinking sweet drinks. Stayed at Golden Dreams in July, terrible hotel, building work going on in the next 2 hotels dust flying all over when tried to sunbathe, view from balcony derelict land with rubbish lying around, had to go out to escape noise of drill building swimming pool next door. No entertainment at all nothing but the swimming pool for kids, only been open one year but room grubby broken mirror sockets loose boiler dripping, when ask for it to be fixed maid stuck bin under. Down stairs lobby full of flies in whole 2 weeks, if you stay here and you are put next to lift asked to be moved straight away lift makes terrible noise like grinding metal when complained it was switched of for one night only but nothing was done only thing enjoyed about holiday was coming home it is ashamed because their are some lovely hotels might have enjoyed it if stopped some where else. The hotel was very clean and the staff were friendly but there was not very mutch to do at the hotel. the room was very clean and tidy. Our toaster did not work but they happily replaced it. We had a slight problem with beetles but it was not that bad. The bar was nice, but the staff werent exactly the jolliest, exept the receptionist she was very kind. I would not visit this hotel again, but I wouldn't even go back to Bulgaria again. We booked the Golden Dreams through the private rentals on this site. Its the first time we have booked ourselves, so we were a little aprehensive. We had no reason to be as everything went like a dream, we pre booked our taxi and were collected at the airport and were in the apartment within 20 mins of leaving customs. The check in was so easy as the reception were expecting us, and all the staff were so helpful throughout all of our holiday. The apartment was very large and and spotless, with loads of extras, dvd player etc. Only bad thing was the busy road you have to cross on the way to the beach. The apartments are of a very high standard with 2 x cable TV's with some English speaking channels. MTV, VH1, eurosport, BBC news etc. Bar/restaurant was good with friendly staff. Multiplace Disco bar next door was excellent playing 80's and 90's classics Don't use the other club though as it is for locals with local music. The developers have a great new place over the road called Sunny Dreams which unlike Golden Dreams has a south facing pool which gets the sun all day. We will try and stay there next time. Good location 3mins walk over road to main resort but out of noise and crowds to sleep. Pool area has to be seen. Best apartments in Sunny Beach from what we saw. One bedroomed apartments are spacious, spotlessly clean with plenty of storage space. Air Conditioned with kettle, toaster, hairdryer, 2 TVs with satellite (one in the living area and one in the bedroom). Nice bathroom with shower, but as there are no shower trays the floor was extremely slippery after using the shower. Pool nice but half of it is in the shade, making it quite cold, and the sunbeds round the sunny side are dangerously close to the edge of the pool. Kids pool fine. The hotel is across a very busy road from the main resort and crossing (even at the pedestrian crossing) is not easy. There is a complex next door containg a nightclub, restaurant and a couple of bars. We were on the first floor overlooking the pool, facing this entertainment complex, and on some nights the music was loud until 6.30am (especially at weekends). The Bhudda Bar will grudgingly serve foreigners, making it blatantly obvious we are not welcome and the night club, claaed Extrem, only allows Bulgarians in! The apartments not overlooking the pool, facing the road, had no problem with the noise. Restaurant food is lovely but service very slow. We waited 1 hour and 15 minutes for a spaghetti dish! Drinks service quick and efficiant. The market area can be easily accessed without crossing the main road (by walking down the lane past the Bar/restaurant complex next door). There are 2 excellent restaurants - Djanny's, in the market area, and The Condor, on the main road, towards the centre. Both are excellent value and the portions are huge. Southern Nights offers a great night out with great food and a good show for adults and children and is only 5 minutes walk from Golden Dreams. We had a good holiday. It was our second visit to Sunny Beach in two years and we don't plan to return because it is too commercialised now. Last time we went there were lots of activities for children but most of them have now been replaced by bars and shops. It looks like they are aiming for the 18-30 age group now so we are going to try Sozopol next year.